This deviation is rather common in adult women and more rarely in men. The first spider veins symptoms are not in evidence too much. 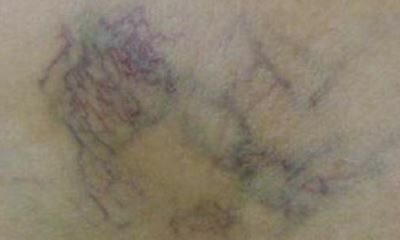 These are tiny and thin veins colored in brue or purple. The name is derived from their form reminding the spider webs. In addition to the cosmetic effect the condition can cause discomfort. One way or another these threads under the skin may be the signs of deep vein thrombosis, which develops slowly until it becomes a serious problem. 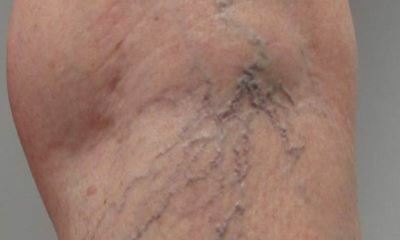 Among the signs of spider veins (picture 1) we can mention fatigue, swelling when they appear in legs. But the main reason to make us concerned is the fact you can see them. 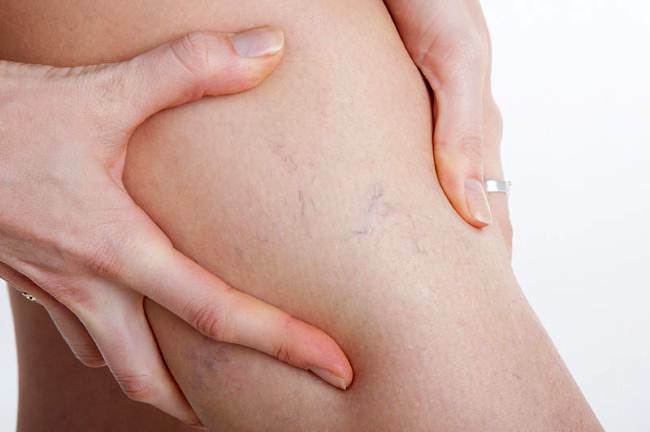 The spider veins look like cosmetic handicap and in general people do not feel any pain but when you see them in several areas it is hight time to visit a doctor and to remove the root problem in order to prevent the trnadformation of the easy signs of spider veins into the secondary conditions. If you scrub the damaged skin, they can bleed and the bruise may appear in that place. But the worse result of your ignorance is develepoment of varciose veins with pain and ulcers in the future. The most frequent cases are the damaged veins in legs (picture 2) and that is natural because they are loaded most of all under the weight of the body in particular if a person is involved in activity connected with continuous standing or walking. 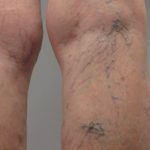 At first, spider veins on legs do not disturb a lot, until this cosmetic concern is replaced with the first symptoms of varicose veins in legs, which further on develop in rather severe conditions like bulged veins, ulcers, which can lead to amputation if no measures are taken. 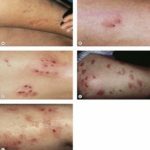 Thus, the simple telangiectasias (pictures in the gallery) with its signs in the form of visible small blood vessels appearing just near the surface of the skin, can be a beginning of the complicated diagnosis requiring the continuous treatment. But if truth be told, bulging veins in legs (pictures below) is not always indicative of venous insufficiency or thrombophlebitis. Even healthy veins can bulge. So, to exclude medical conditions you sould go to see a vein specialist. When you work out a lot or if you are too slim having a low level of body fat, or if your skin is too thin that is usually happening while aging, the bulging veins can be normal. But if they do not disappear and get worse causing pain and skin changes, it is a health condition requiring medical help. When you observe unexplained burst vein in leg (picture 3), one of the probable reason for it is telangiectasia. Even if the veins are not bulding and there is no pain, the burst can happen. A patient may feel a kind of stinging sensation at that area compared to bit by a insect. If nothing is done about it, the damaged skin can start itching. The patient feels mild pain in this area, finds darken and sometimes swollen skin there. The burst usually heals without treatment during a week. Though, even in this case it should not be left without attention. It can be a sign of blood clot in toe or any other location. In order to prevent systemetic problem connected with veins and arteries, look for health assistance and perform proper medical diagnostics. As we mentioned above the spider veins (images below) can lead to such bleeding into the skin, but more ofen the reasons are injuries, allergic reaction, side effects of medications, diseases like leukemia, physical load, etc. Only a doctor can determine the cause. If it is connected with spider veins the sclerotherapy can be suggested. 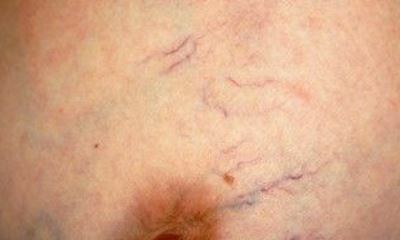 The spider veins are considered as benign condition. Before they thought that it was caused by high venous pressure but now it is known for sure that venous reflux disease leads to this cosmetic concerns which can become complicated in due course. 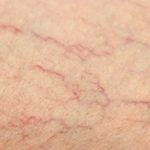 The disorder is rather common among aging people especially women and usually observed in legs and face but there is also spider veins on chest (picture 4) and the most frequent reason for it is sun damage. In addition it can be the result of hormone disbalance or traumas. The liver disorders and vein disease (pictures at the bottom) can also cause the spider veins appearing in this area. In order to find out the correct answer turn to a physician. Depending on your condition you can find other proves all over the body. It means that blood clot in thigh can be a reason too. Do not wait until quality of life is affected. 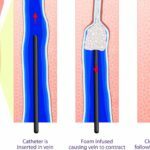 There are a lot of methods to treat spider veins which can remove the visual signs of it and prevent development of severe consequences. One of the efficient and easy ways to treat spider veins is sclerotherapy (picture 5). The procedure is not difficult being a simple injection. The medicine is injected into a vein. The sclerotherapy recovery is almost immediate. Though, it is not prescribed to everybody. 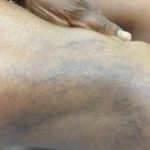 If the veins are painful, or there is heaviness in legs, and the skin is dry and damaged around the ill vein, there is a high risk of sclerotherapy complications (pictures below). But in general this is a safe method without need in anesthesia. The patients can experience sclerotherapy bruising near the injection, which usually dissapear without any additional measures. But sometimes there are also severe sclerotherapy side effects (photos below) like difficult breathing, chest pain and dizziness. 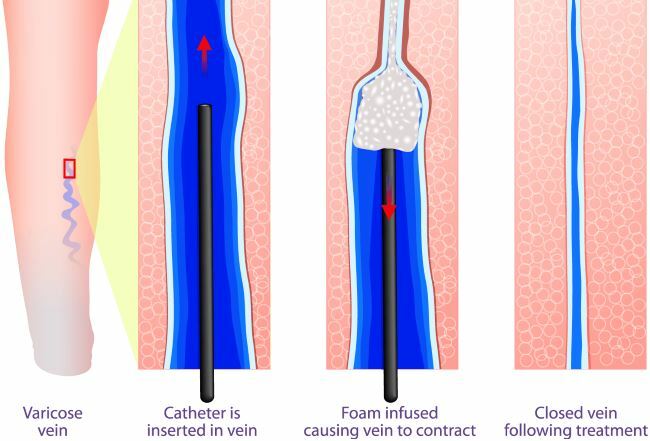 There is a very rare result – a blood clot can appear in the place where the vein was treated. It is well known that clots can travel through vessels and this is life threatening. Do your best to keep your veins healthy. And as far as the most common place for this disorder is legs, pay attention to them. If you are involved in the activity leading to blood pooling in legs, you are recommended to spend some time with legs elevated at the level higher than the level of your heart.